Symphony #7a in G Major, K Anh. 221 (45a) "Old Lambach"
There is no magic line to divide Mozart's "early" and "late" symphonies, although on more than one occasion the "Little" G-minor (#25, KV 183) has been identified as the first late symphony, probably because of its Sturm und Drang characteristics – a new tack for the composer at the time. It is good, however, to remember that Mozart still was a teenager when he wrote it! 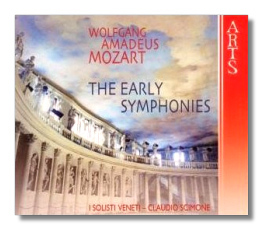 2006 is a Mozart year – he was born 250 years ago – and predictably, there has been, if not a flood, then at least a steady stream of new recordings and reissues, including the three under review here. These are not exactly new recordings. The Harnoncourt sets were recorded in 1999 and 2000, although I don't think that they have been released until now. The Scimone box is older, from 1991 and 1994. (The four discs appear to be available separately.) As all of these discs were issued at approximately the same time, comparing and contrasting Harnoncourt and Scimone seems like the natural thing to do. The first thing to remark upon is the repertoire itself, which takes us back to my first paragraph: Harnoncourt includes symphonies not included by Scimone, and vice versa. (Actually, Harnoncourt refers to them as "sinfonias" - the term used by Mozart himself.) It is not easy to know what to include and what to omit. Although most music-lovers will tell you that Mozart wrote 41 symphonies, he actually wrote more than 65. Some are lost. Some exist in alternate versions. Some are of questionable authorship. Publisher Breitkopf and Härtel came up with the numbering system which gave us 41 symphonies. Correctly, Harnoncourt's set informs us that this numbering system is "outdated but still popular." I, for one, am a creature of habit, and I am unlikely to stop referring to the "Jupiter" symphony as "No. 41" just because of the New Mozart Edition! (Scimone's set prominently displays B&H numbers wherever they were assigned, whereas Harnoncourt's relegates them to small print inside the booklets.) The bottom line is that one cannot really criticize either conductor too harshly for what they do and do not record here. Also, although there is considerable overlap between Scimone's and Harnoncourt's discs, there's no exact duplication. And that's good, because Scimone and Harnoncourt take completely different approaches to this music; there's no duplication in realization or interpretation, either. The members of I Solisti Veneti play in a more or less modern style, albeit with appropriately reduced numbers: there are between nine and twelve violins, three violas, three or four cellos, two or three double basses, plus woodwinds, brass, and timpani as required. The instrumentation is not listed on Harnoncourt's sets, but he seems to be using an ensemble of about the same size. Harnoncourt was one of the fathers of the "authentic performance practice" movement, and Concentus Musicus Wien has been his mouthpiece, if you will, for something like four decades now. The musicians of I Solisti Veneti make sounds which are smooth and genteel. Concentus Musicus Wien are rough and excitable. Of course that's a generalization, but in this case, it's still useful. One can hear many of the differences between these two collections just by comparing performances of the first phrase of the first symphony, KV 16 in G. First, Harnoncourt's performance is pitched lower than Scimone's, another common feature of so-called "authentic" performances. (Since Mozart's time, the concert "A" – and all the other notes surrounding it, of course! - has been getting higher.) One immediately notices the "buzzier" and more textured timbre of the Viennese strings. The first phrase is based on a major triad that rises and then falls; at its peak, Mozart repeats the note seven times. Harnoncourt builds a crescendo across the repeated notes; Scimone stays at approximately the same dynamic level. Harnoncourt also is somewhat slower. 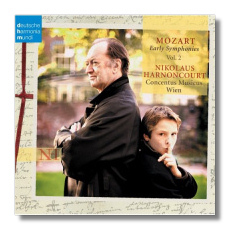 Harnoncourt is out to impress the listener, to tell him or her that Mozart, even before his tenth birthday, was forecasting the course that music would take over the next century. Scimone seems to be saying, "Yes, but even so, Mozart still was a child, and also a child of his time, and it would be wrong to play his early works as if we knew what musical developments would occur in the coming decades." 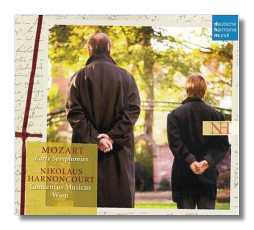 In general, Harnoncourt conducts Mozart as Mozart eventually came to see himself: ahead of his time. Scimone conducts Mozart as many others wanted him to be: a supreme entertainer, but not necessarily someone who challenged the status quo. Played this well, there's plenty of room for both of these approaches. I will be returning to Scimone for pure pleasure, and for the well-groomed mellifluousness of his performances. I will returning to Harnoncourt for surprises, adolescent excitement, and the occasional poignant moment… perhaps for even a tear or two. Arts makes a big deal of Scimone's readings being recorded at the Olympic Theatre of Vicenza, Italy. The engineering is well-balanced and not overly close. Harnoncourt's readings were recorded in the Kasino Zögernitz in Vienna, and because they are more closely-microphoned they are more detailed. Again, which is "better" is a matter of personal preference. I'm happy to have heard both.